On-line registration for this event has ended. To sign up, please call Fleetwood Jacobs on her cell (512) 296-6395. Are you committed to keeping the Hill Country’s rolling hills and quality of life here forever? An avid hiker or biker of the Violet Crown Trail, excited by a first of its kind regional trail system? Curious about the work of Hill Country Conservancy? Join us for our HCC Walk & Talk! 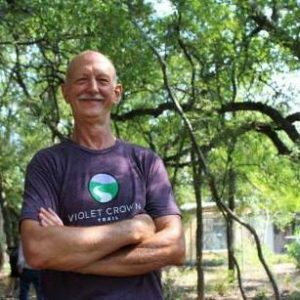 You’re invited to join George Cofer, Hill Country Conservancy’s CEO and founding Executive Director, for a hike along the Violet Crown Trail. You’ll have the opportunity to chat with George about all things HCC – conservation, the Violet Crown Trail, life in the Hill Country and more! We encourage individuals who are both familiar and unfamiliar with HCC to Walk & Talk with our fearless leader. This event is free to attend! Register here. George Cofer is a sixth-generation Austinite and fifth-generation Texas rancher. His love of the great outdoors and conservation of the natural environment come from being blessed by the opportunity to spend his childhood summers on a working cattle ranch along the Frio River in Uvalde County and from his outdoor experiences as an Eagle Scout. George is the founder and CEO of Hill Country Conservancy and has been a leader in helping to preserve almost 50,000 acres in Central Texas. Please RSVP using the “register” button. You will receive a confirmation email upon submission and informational email the week of the hike. In case of inclement weather, an email will be sent with an alternate meeting location. – Please wear closed-toe shoes and weather appropriate clothing. – This is a family friendly event. – Dogs are welcome on the trail, but must remain on a leash. – Anticipated time on the trail is 1-1.5 hours.